In his set-up for Small Movements (2016), Adam Basanta uses two microphones and seven loudspeakers in different combinations to create acoustic feedback. The sound of the feedback is surprisingly “clean”: it contains not much noise, but focuses essentially on a single pitch. 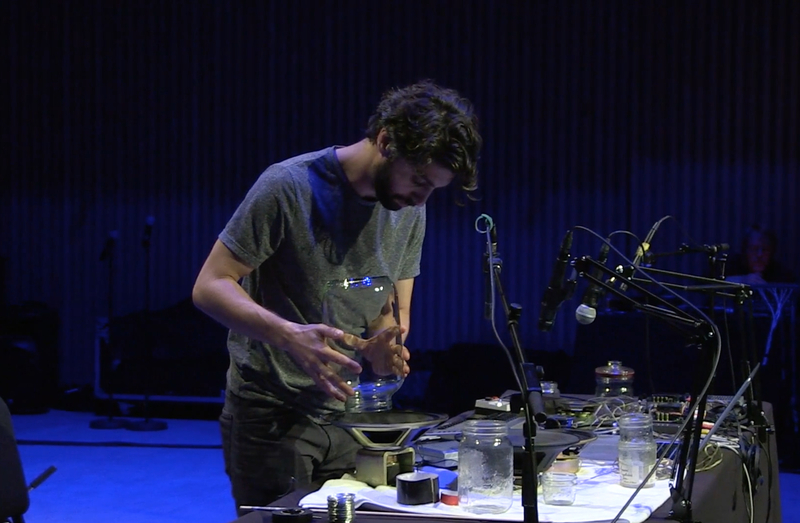 This is no coincidence, because besides the seemingly chaotic set-up of all kinds of glass jars, wires, and cassette players, he uses the music software Max to precisely control the resulting sound. There is a constant interaction between the physical sound creation with the objects on the table and the virtual sound control in the computer. Let’s first have a look (and listen) at how Adam uses the objects on the table to influence the sound. As mentioned before, acoustic feedback is an important element, and an example of this can already be heard at the very beginning of the documentation video (you find the video at the end of this post). 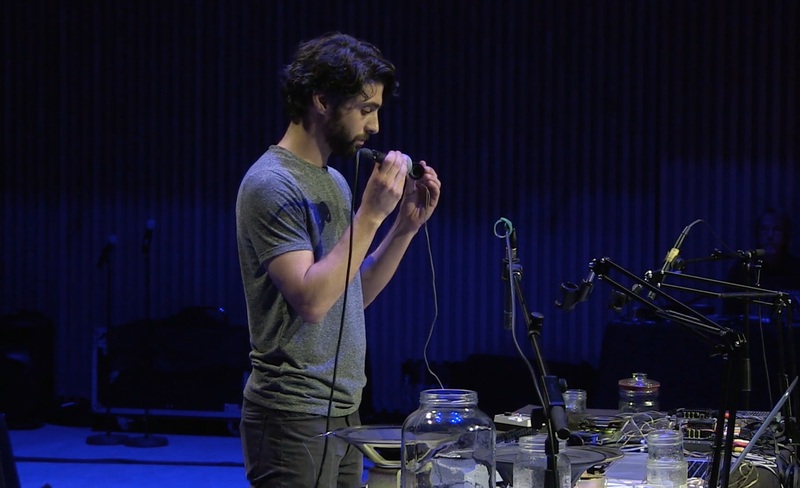 Physical interaction is done also by putting a stick on a loudspeaker membrane (see 15:44 in the video). On a later occasion Adam uses a metal wire (16:40 in the video). Due to low frequency sine waves sent from the computer to the loudspeaker (more on this in the part on the computer software used), the membrane will move back and forward and the stick or wire jumps on the membrane, causing a quick rhythm. The jars are used as what could be called a physical filter. By placing them on or close to a loudspeaker, the sonic outcome is influenced by the resonance frequencies of the jar (see 14:15 in the video). By holding a jar close to a microphone, the microphone picks up the resonance frequency of the jar and as a result, the pitch of the feedback will change (see 20:30 in the video). 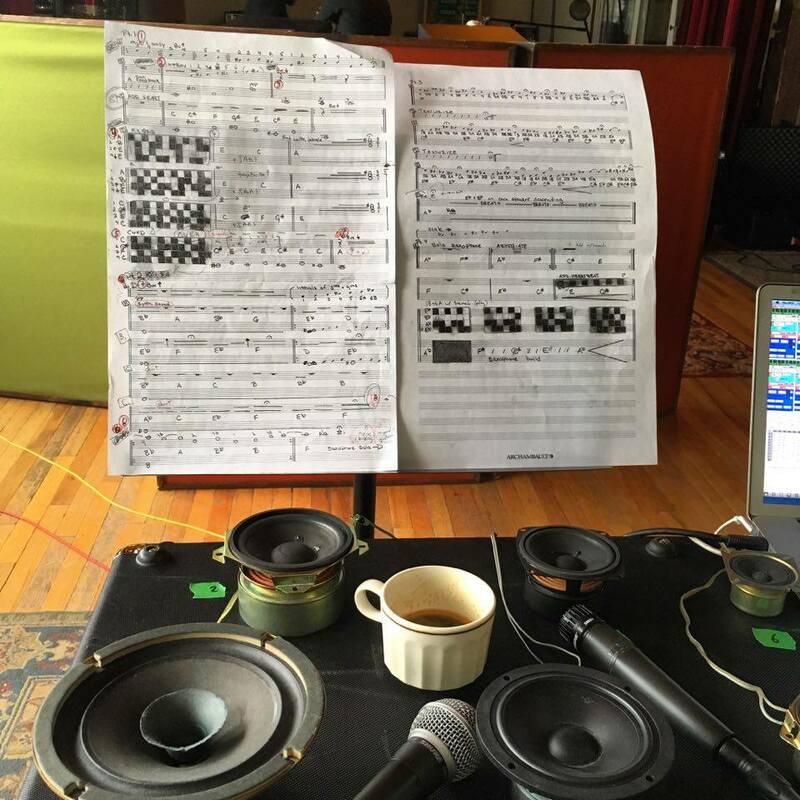 This physical sound creation is now enhanced by the use of a computer software. A patch created in the music software Max manipulates the signals coming from the microphones before they enter the loudspeakers. I asked Adam what kind of sound processing is going on and he let me know that “Of course, there is some serious limiting on each channel, calibrated to each speaker’s capacity in order to avoid burning them out. But the main processing occurs through two algorithms, which regulate the feedback frequency and amplitude. For frequency, I use various filtering techniques, […] which only allow feedback to occur at specific frequencies. 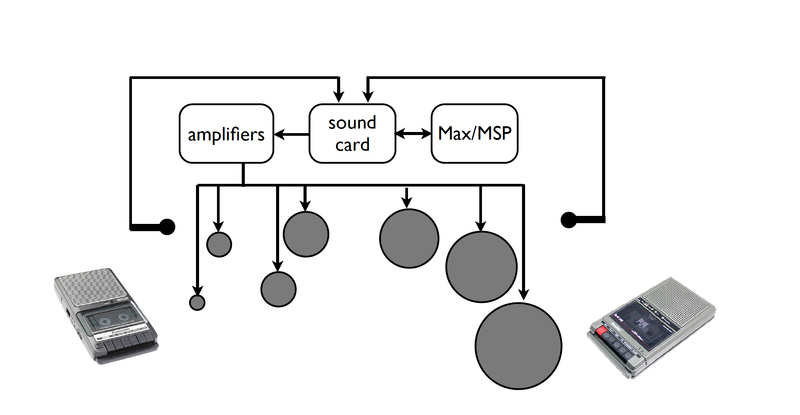 Filtering can allow very precise control of the frequencies, and also allow me to create feedback in ways which are very unfamiliar to us: for instance, very low frequency feedback, or a tonal triad using feedback.” The processing thus keeps the feedback within reasonable loudness and avoids damage to the loudspeakers. With the help of a Max patch, the feedback frequencies are fixed quite precisely: 14 different pitches can be played by using the 14 possibilities of feedback between the two microphones and seven loudspeakers. And with the use of a foot pedal, Adam can switch to another preset in the Max patch, giving him a new row of 14 different pitches. In Small Movements different kinds of technologies are used in innovative ways. Although you might have the impression that you see all sound processing happening, much is done through the help of virtual sound processing in the computer. Besides the heavy filtering of the feedback sound, the low sine waves mentioned earlier are another example of sonic material generated by the computer. By using these low frequency movements of the loudspeaker membrane to “play” a stick or metal wire Adam connects the computer software to the physical sound production.